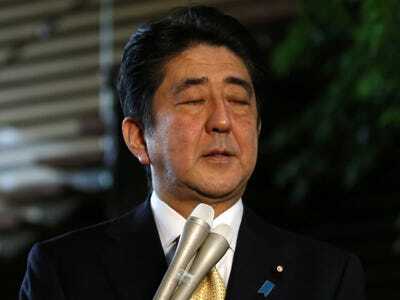 REUTERS/Toru HanaiJapan’s Prime Minister Shinzo Abe. Good Morning! Equity futures are under some pressure, led by a 30bp drop in the S&P. Tokyo is the overnight headwind, as Japan’s GDP plunged on the Consumption Tax hike — That hit the Nikkei for 3% and sparked selling in Industrial/Growth names globally. Right now the DAX is off 30bp, while volumes across Europe are quite light as all eyes on Draghi when he delivers his testimony on monetary policy before the Committee on Economic and Monetary Affairs at 9amET. Over in Asia, Russia’s MICEX shrugged off Putin leaving G20 early as fresh sanctions are bantered about – Shanghai outperformed as investors used the new HK link to the mainland to snap up Chinese stocks — India cruises to another record close, and Aussie dropped 75bp as banks are still weighed by last week’s regulatory headlines — Ore miners under pressure, but Gold Miners had another nice pop. The 10YY in the USA begins under pressure, as we near new wides in US-German Yield differentials. The DXY is higher, with the $US gaining ground against Euro and Yen — a headwind for commodities. Industrial and Energy commodities are weighed by Japan as well — with Brent off 1% and Copper down 60bp. In metals, gold is unchanged, but Silver’s industrial uses are hitting it for 1% early. The standout commodity winner is Natty – popping as an arctic air blast lowers temps in Central and Eastern USA 20-40degrees below average this week. Scheduled Catalysts today include Empire Manufacturing at 8:30, the Draghi Testimony at 9, US Industrial Production at 9:15, at 9:30 the ECB Announces Covered-Bond Purchases, while at9:45 ECB’s Benoit Coeure Speaks. Finally, at 10am, we have the Fed’s Evans giving Opening Remarks at Agriculture Conference. Some trades I am on the lookout for include the ITB, which is struggling to hold new breakout highs above $US25 into Eco data (Existing, Pending, NAHB), as well as HD #s Tuesday, and LOW Weds (total 8% ITB) — Watch the EWZ (Brazil), near YTD lows into the PBR call at 8amET – JPM has a nice chartpack out, reversing their UW Europe v. USA stance (lets see if that holds in the face of a deteriorating Russia) — watch the Gold Miners, as they continue their short-cover action from last week as the metal stabilizes into the SNB vote on the 30th — The OIH and XOP as shorts digest HAL for BHI at a substantial premium — and finally today should bring us the “Good Harbour” rebalance.